When you lose a tooth, Dr. Bryan Hill returns full beauty and function to your smile with a dental implant restoration. A bio-compatible titanium post is placed where your tooth root once stood. Soon, bone growth envelopes the post, making it a secure anchor for a prosthetic crown. A lifelike and lustrous crown is attached to the post using an abutment, giving you a comprehensive restoration of a tooth and tooth root. Implant-supported teeth are free-standing and do not require any alteration of healthy teeth for their support. The post stimulates the jaw bone, keeping it strong and promoting the health of teeth nearby. This permanent replacement looks and feels like a natural tooth. Contact the dental office of Bryan Hill, DDS, in Spokane for expert placement of dental implants and gorgeous restorative crowns. When tooth loss affects two or three teeth in a row, an implant supported bridge can return full form and function to your smile. Usually, a bridge requires the placement of two implant posts into the jaw bone. After about four months, bone growth surrounds the posts, making them sturdy and strong enough to support a prosthetic bridge. Dr. Bryan Hill strategically places dental implants, so they equally support the prosthetic bridge. Bridges are made of porcelain matched to the patients’ surrounding teeth. Bridges are permanently placed on the posts using secure abutments and avoid the need for adhesive pastes or metal clasps to remain secure. Implants also provide the added benefit of preserving jaw bone mass, maintaining your youthful facial structure and protecting the health of surrounding teeth. Treating people in Spokane and surrounding communities, Dr. Bryan Hill can replace several teeth with a comfortable and comprehensive implant-supported bridge. For those who have lost a full arch of teeth, implant-supported dentures not only restore full function and aesthetics to your smile, they also help you retain a youthful facial structure. 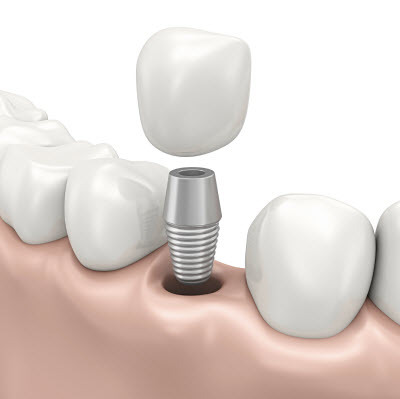 Dental implants preserve bone structure and prevent the mouth from appearing sunken and aged. Dr. Bryan Hill strategically places implant posts into the jaw, and after about four months, they securely fuse with the bone. Dentures can then be placed using as few as four implant posts, which saves you time and money. The dentures are made of acrylic and luminous porcelain crowns that are custom designed to complement your natural beauty. Hybrid dentures are permanently placed on implant posts, and over-dentures are removable, clasping onto abutments. To learn more about the convenience, comfort, and restorative benefits of dental implants, contact Dr. Bryan Hill in Spokane. We have the technology, training, and high standards you need to receive excellent dental care.